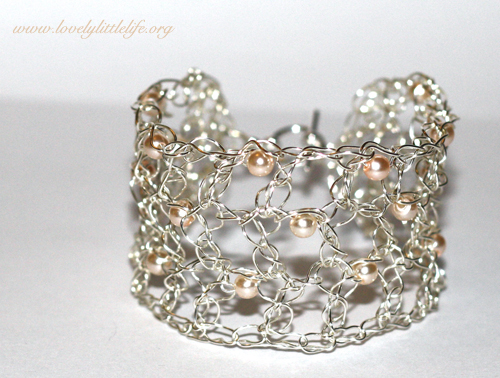 I posted about this bracelet last week some of you expressed interest in the pattern…. Sooo…. 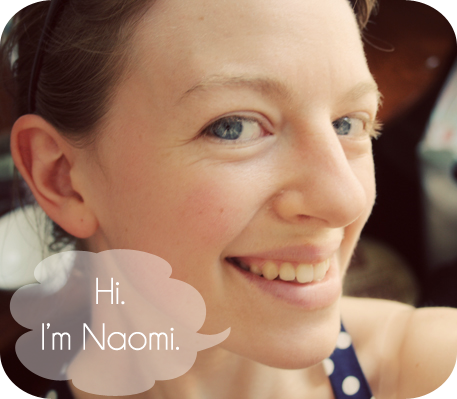 Here I am with my first ever photo tutorial! Hopefully you will find it helpful! As you might expect you are in for an extremely photo heavy post! Lets start with the humdrum technical bits, shall we? I use UK terminology, these are the stitches and abbreviations being used. 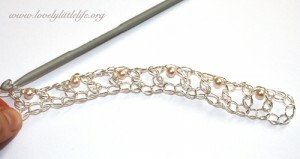 The first thing you need to do is determine the length your bracelet should be. Do this by measuring your wrist, taking into account how tight or loose you want it to be. Whatever this measurement is take an inch off to allow for the clasp length. 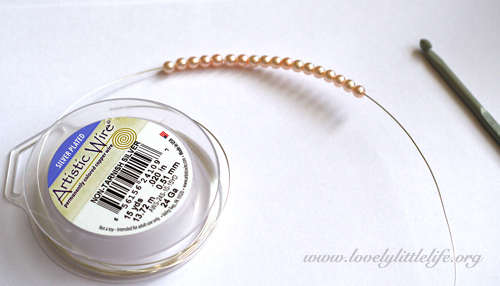 To start, thread all of your beads on to the wire before anything else. Tie a slip knot into the wire as you would with yarn. You may want to use your pliers to help pull it tight, a knot like you see above is fine. Start making chains, you will find that working with wire requires a little more effort than yarn, there will be some tugging and pulling! 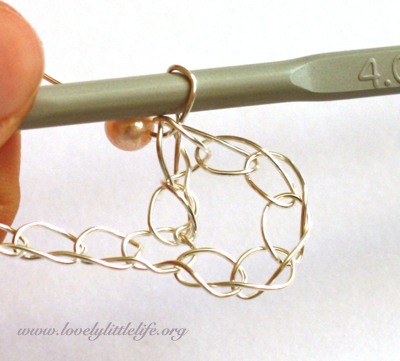 Keep making chains until you have a length that equals the measurement you took earlier. Make sure this is an odd number of chains, here I’ve chained 25. Then chain on 3 more, bringing the example to 28 chains. These act a your first treble and chain of R1. 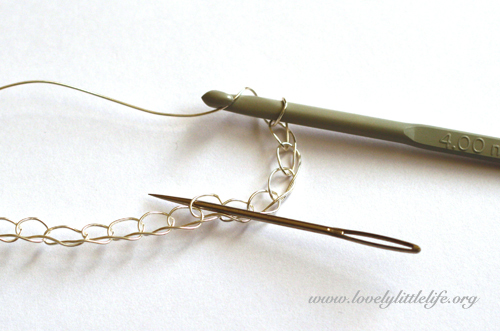 R1: Make a treble into the 6th chain from your hook, as the needle shows above. You should now have something that looks like this! Now to start adding beads. 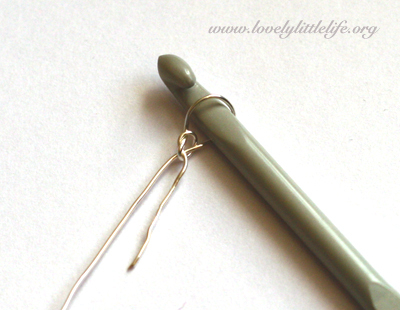 Slide a single bead along the wire until it sits under your hook. 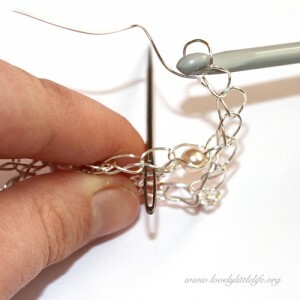 Complete a chain (wire round hook, pull through) keeping the bead snug to your work. 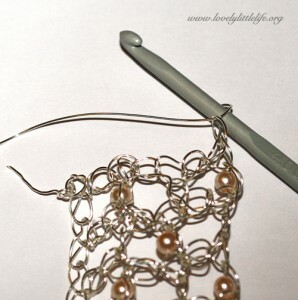 The first stitch of R2 is a treble into the treble of the previous round, where you see the needle above. All trebles are made into previous trebles and all chains are skipped. It should start looking like the picture below. R3: ch3, *tr, chWB, tr, ch1*, Repeat ** 4 times, tr, chWB, tr into last st. This is the bulk of the bracelet done, hoorah! All thats left to do is shape the ends and attach your clasp. 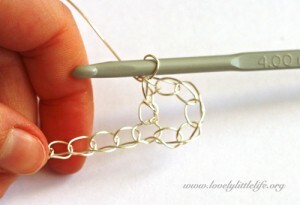 Start by rotating your work 90 degrees clockwise and chain 1. Make a htr in the next st, a tr in the next st, ch1 and skip a st, tr in the next st, htr in the next st and ss in the last st. 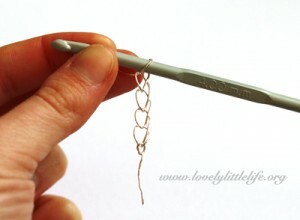 Finish off by cutting the wire leaving a tail. Pull it through the last stitch and pull firmly. 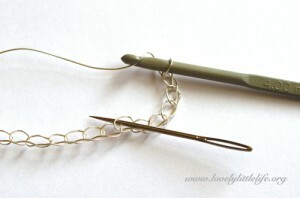 Weave the tail end in and out of your stitches, you might want to use your pliers to help here. Cut of any excess wire and make sure the ends are bent into the bracelet, not poking put where they can scratch. Do the same with the original tail end aswell. Turn the work to the opposite end. 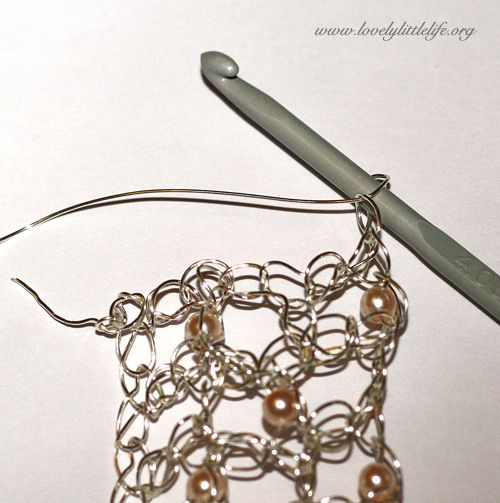 Insert the hook into the first stitch and pull a loop through. Holding the tail end firmly, chain 1. 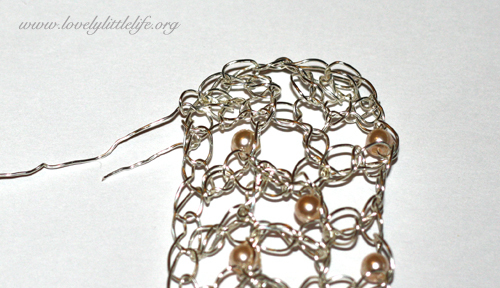 Now wrap this tail around the edge of the next stitches so it can be crocheted over, as above. Make a htr in the next st, a tr in the next st, ch1 and skip a st, tr in the next st, htr in the next st and ss in the last st. Finish off and weave in ends as before. 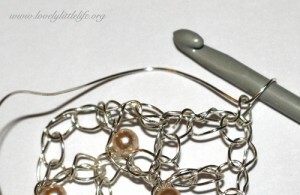 Attach each part of the clasp using the jump rings to the central chain space at each end. 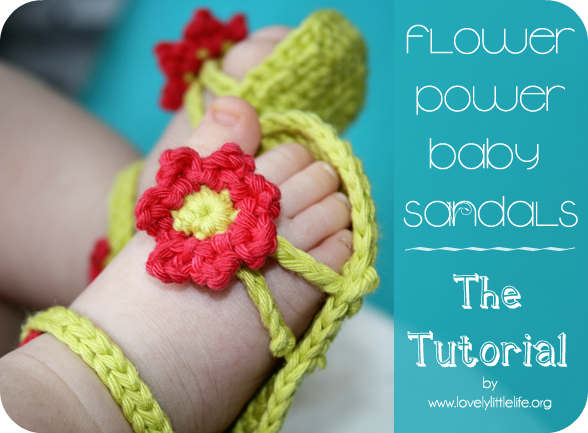 Here is the quick written pattern for those of you don’t need the step by step! Determine the length your bracelet should be. Do this by measuring your wrist, taking into account how tight or loose you want it to be. 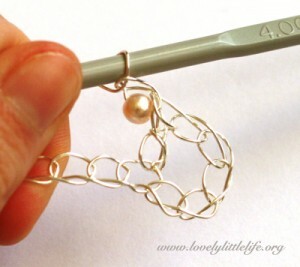 Whatever this measurement is take an inch off to allow for the clasp length. Chain this length ending in an odd number, then chain 3 more. 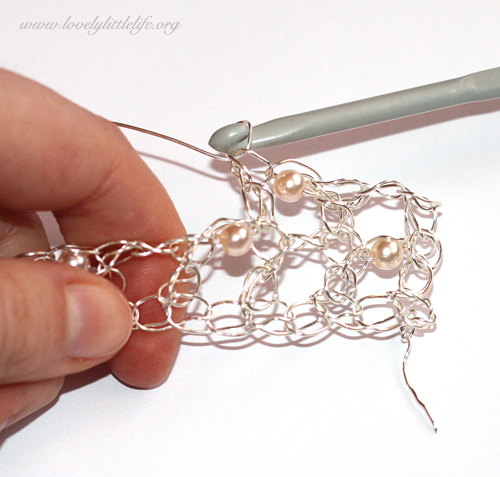 The following pattern will create a bracelet with a 7.5in circumference, adjust the stitch repetitions to suit your bracelet size. R1: tr into 6th ch from hook, *chWB, skip next ch, tr in next ch, ch1, skip next ch, tr in next ch*, repeat ** 4 more times, chWB, tr into last ch. Turn. R2: ch3, *skip a st, tr in next st, chWB, skip a st, tr in next st, ch1*, repeat 4 more times, skip next st, tr in next st, chWB, skip next st, tr in last st. Turn. R3: ch3, *skip a st, tr in next st, chWB, skip a st, tr in next st, ch1*, repeat 4 more times, skip next st, tr in next st, chWB, skip next st, tr in last st. Rotate work 90 degrees clockwise. R4: ch1, htr in next st, tr in next st, ch1, skip a st, tr in next st, htr in next st, ss in last st. Fasten off and weave in ends. R5: Turn to the other end of the work, pull through the wire, ch1, htr in next st, tr in next st, ch1, skip a st, tr in next st, htr in next st, ss in last st. Fasten off and weave in ends. Finishing: Attach each part of the clasp using jump hoops to the central chain space at each end of the bracelet. Ensure there are no sharp ends sticking out anywhere. One last note, always over estimate the number of beads you thread on at the beginning because once you start there’s no going back to add more! Phew! Did you make it all the way through that in one piece?! Beautiful!! 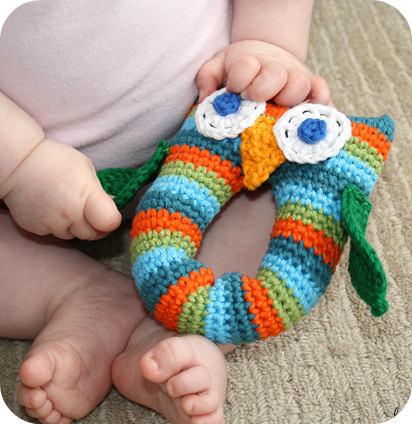 Crochet makes my head spin. I’m glad you posted all of the photos in case I get ambitious! I really love this. You did a great job explaining the pattern. 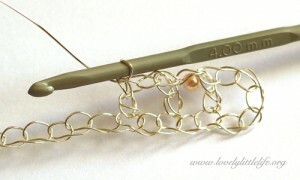 Can’t wait to make this bracelet. 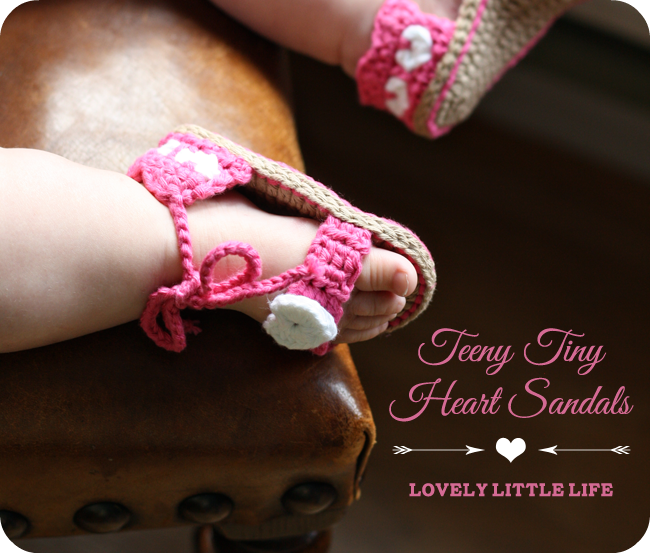 How do you get the chain size/stitch size so consistent? I did make one, but was having a hard time with the wire. Thank you so much for such a great tutorial! 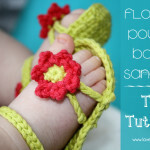 I love this tutorial, thanks! I’ve finally gotten the hang of tiny crochet (with 1.5mm hook and less) and so this is my next conquest! 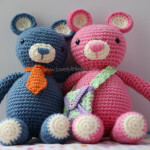 Just wondering if you allow people to recreate and sell this item? 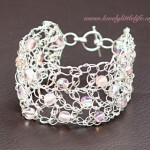 Naomi, I love this bracelet but how do keep the wire from breaking? Especially when putting it on and taking it off, seems to me if you keep bending it around your wrist it would eventually crack in places. thank you for sharing this beautiful bracelet with all of us. Looking forward to starting it tonight. I also use artistic wire as I find that it is very durable for these projects. IHope you have a wonderful holiday season. 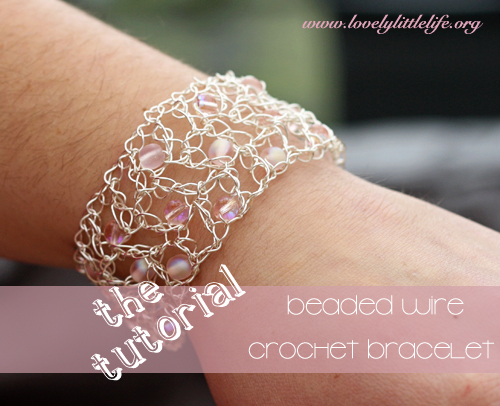 Hi – This is the first time I have made a wire bracelet (but I am an avid crocheter). 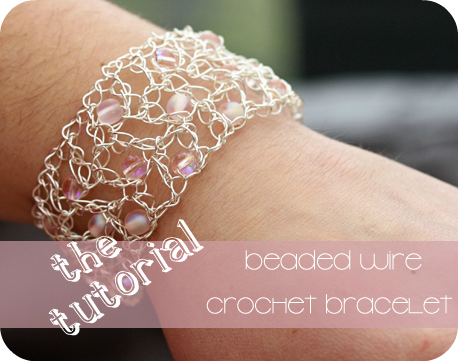 I did the bracelet body, the first end part – and kept on with single crochet across the long side – did the other end – and finished with single across the other long side. It gave it a little more body. Thanks for the good instructions.